Massachusettts State Police Marine Unit patrolled Boston Harbor. 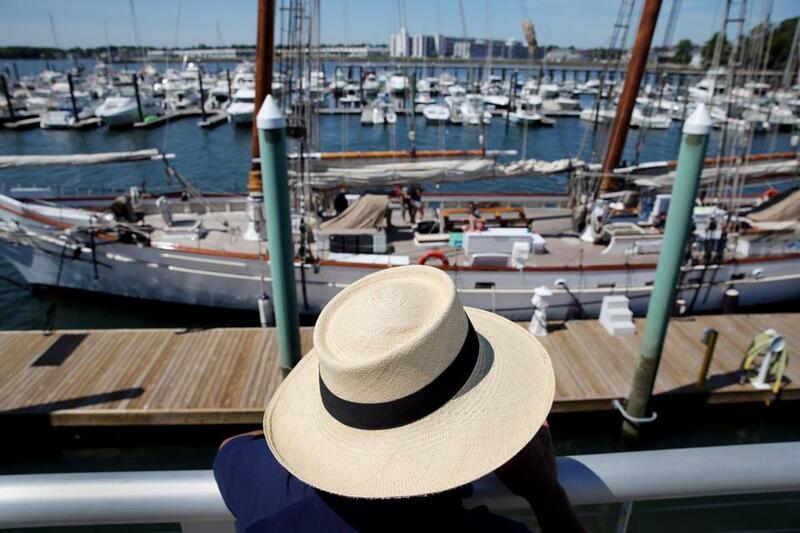 The much-anticipated arrival of the Tall Ships in Boston this weekend has been designated one of the highest security risks in the country this year. The much-anticipated arrival of the Tall Ships in Boston this weekend has been designated one of the highest security risks in the country this year, ranking behind only a handful of national events such as the presidential inauguration, the state’s homeland security adviser said Tuesday. The federal government’s analysis, known as “special event assessment rating 1,” ranks the event as a greater security risk than the Boston Marathon and Boston’s July Fourth celebration, and is equivalent to the Super Bowl, said Patrick McMurray, the state’s undersecretary for homeland security. “It's a new world environment now,” said McMurray, who worked for the Secret Service for 25 years. The elevated assessment comes after several terror attacks in Europe that have targeted scores of civilians and put law enforcement on even higher alert. Boston has not had a security operation of this scope since the Democratic National Convention in 2004, McMurray said, and fewer than 10 events in the United States this year have been classified as SEAR 1. McMurray stressed that no specific threat has been discovered, and that a broad array of law enforcement agencies has been working closely for many months to ensure that Sail Boston 2017 is a safe event. But several factors — millions of potential spectators, complex geography involving land and sea, and the arrival of foreign ships and dignitaries, for example — prompted the Department of Homeland Security to label Sail Boston as SEAR 1, he said. By contrast, the Marathon and Independence Day concert on the Esplanade are designated SEAR 2, he said. Thousands of public safety personnel, including the entire Boston Police Department, will be deployed during Sail Boston 2017, which is scheduled to begin with a parade of more than 55 Tall Ships on Saturday and last until the vessels depart June 22. At least 3 million spectators are expected to attend. Security will be provided on land, air, and sea, including protection from three Coast Guard cutters and the air wing of the State Police. Spectators will undergo individual screening and be barred from bringing a range of items to the viewing areas, including backpacks, cans, bicycles, firearms, and sharp objects. “We’re using all the tools we can to keep the citizens safe and be reasonable,” McMurray said. That will include parking restrictions and road closings, including Northern Avenue and many secondary streets in the Seaport District. 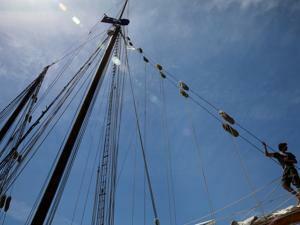 John Kelly, the national homeland security secretary, was recently briefed on Sail Boston preparations, McMurray said. The public safety presence will be about four times as large as it was during the last Boston appearance of the Tall Ships in 2009, said Dusty Rhodes, the event organizer. More than 60 agencies have been meeting regularly to coordinate security in a broad arc from Castle Island in South Boston to Deer Island in Winthrop. A robust contingent of undercover officers also will be deployed. “Given the world that we live in now, we have to think of this as large scale,” Rene Fielding, the city’s emergency management director, said of security precautions. Sail Boston planners heard from the federal government in February that the event had received high-risk status, Rhodes said. Organizers and public safety officials have been meeting every two to three weeks for six months, she added. Captain Richard Bailey looked over the Spirit of South Carolina. On Wednesday afternoon, Governor Charlie Baker and Boston Mayor Martin J. Walsh will join city, state, and federal officials to discuss public safety preparations. “It’s sort of an all-hands-on-deck situation,” said Christopher Coakley, spokesman for the city’s office of emergency management. The Coast Guard, for example, will have more than 500 personnel working to ensure safety, said Petty Officer Brandon Hillard. The risk rating means that a federal liaison officer has been assigned to the event and will obtain additional safety resources if needed, Fielding said. Command posts have been set up on the South Boston Waterfront near the Boston Design Center, and 24-hour staffing will begin Friday and continue through the weekend. Deckhand Aaron Funk worked on the Spirit of South Carolina. The central operations room will contain nearly 50 people from 40 agencies, even including a representative from the National Weather Service. A forecast of imminent thunderstorms, for example, could spur an evacuation order for teeming crowds on the waterfront. Officials from the FBI; the Bureau of Alcohol, Tobacco, and Firearms; and the Department of Homeland Security, among many others, will monitor the event. At the command post, a screen has been installed to provide an overview of the harbor and allow officials to look closely at potential problem areas. “We want to make sure everyone is on the same page,” said Fielding, who will be among about a dozen people in a separate room for the unified command team. That group will be responsible for making “game-changing decisions” as Sail Boston progresses, she said. homeland security officials, who have “provided both personnel and other law enforcement resources to ensure a safe and secure event,” said Lieutenant Michael McCarthy, a Boston police spokesman. The agency also will help defray personnel costs associated with the event, he said. Coakley, the emergency management spokesman, did not provide a cost estimate. “It’s tough for the city to determine an actual cost until the event has ended,” Coakley said. 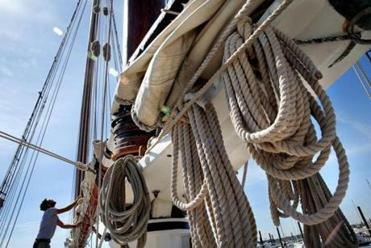 Deckhand Tripp Seaman worked on the Spirit of South Carolina docked in Salem Harbor. Brian MacQuarrie can be reached at brian.macquarrie@globe.com.